Sometimes a tooth that has had endodontic treatment (a root canal procedure) fails. This can happen soon after the procedure or many years following it. The failure of an endodontically treated tooth can lead to pain, swelling or both. A patient in this situation has several alternatives: non-surgical endodontic re-treatment (basically, the “re-doing” of a root canal procedure); tooth extraction and replacement with a bridge or implant; or an apicoectomy. 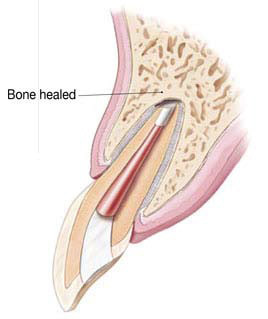 An apicoectomy can help retain the tooth for an indefinite time period. It is a minor surgical procedure with many advantages over tooth extraction followed by an implant. Apicoectomies have been performed for many decades with proven effectiveness, while implants are only now becoming predictable in their results. The appeal of an apicoectomy procedure is that it will be completed in a single visit using local anesthesia, is almost always minimally invasive and, when performed by Dr. Cohen, is microsurgery with extraordinary precision (advantages not present with implants). Dr. Cohen has perfected a special technique, while accomplishing over 500 apicoectomies since 1998. He is the first endodontist in South Carolina to perform apicoectomy under a microscope that magnifies the site 8 times, enabling him to use smaller, specialized instruments to make a tiny incision, opening gum tissue beside the tooth. With such magnification, he gains a better view to inspect and clean the underlying bone and root canals, and better access to remove inflamed or infected tissue along with the end of the root tip. The result is a predictable outcome, shortened healing time and a more pleasant post- operative experience. His technique is based upon the soft tissue (gum) management protocol developed by Dr. Gary Shanelec and taught at Boston University. What makes Dr. Cohen’s technique special is that every aspect of the procedure is performed with extremely fine instruments that can be used effectively only under the microscope. The gum tissue which is moved and manipulated during the procedure has a significantly greater volume of neural (nerve) tissue than the bone surrounding the tooth. Consequently, the care with which the gum tissue (soft tissue) is handled during the procedure determines the degree of post-operative pain and swelling that a patient may or may not experience. At the end of the procedure, Dr. Cohen utilizes mineral trioxide aggregate as the root end filling. This is an extremely biocompatible material that research and literature have shown to result in the most favorable response from the body as compared to other, more conventional choices, such as dental amalgam (silver filling material), super EBA (a soft paste) and composite resin (tooth colored filling material). Mineral trioxide aggregate (MTA) is a material that results in minimal inflammation and actually encourages the re-formation of cementum (the natural, outer covering of the root and bone around the tooth). 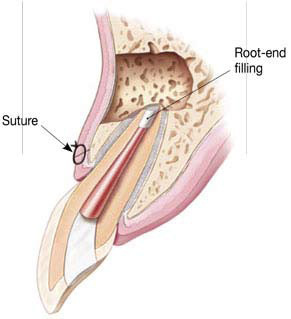 A small filling may be inserted in the root to prevent reinfection and seal the end of the root canal. 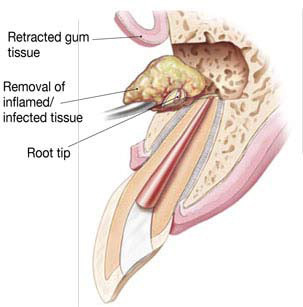 A few stitches are placed in the gum to help the tissue heal properly. Careful follow-up examinations and dental x-rays will confirm that proper healing has occurred. Dr. Cohen will schedule these visits with you as necessary. 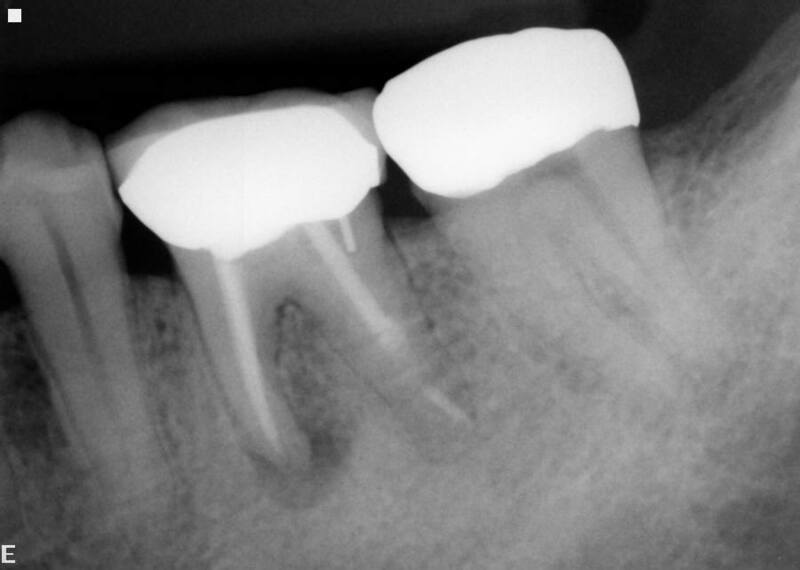 Patient's tooth with previous endodontic treatment failing. 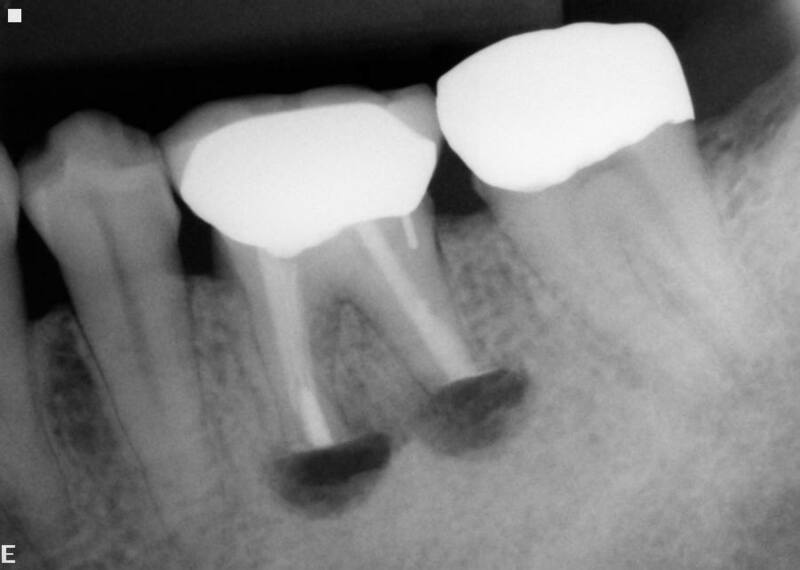 Note the bone loss at the end of the roots which is indicative of a periapical infection. The ends of the roots (apices) have been shortened, the bone has been manually cleaned and the ends of the roots have been filled or plugged with a biocompatible sealer (MTA). This will help the bone regenerate.